William was living in Rochester 27 Nov 1811, and was buried there. A Mr William Alston of Rochester was a Subscriber to the History of Rochester in 1817. There is much information about William available at the Maidstone/Kentish Studies, Kent, filed under the number U487/1 see pictures. This collection of documents deposited by Messrs. Beaumont of London consists of two entirely separate family units, those of the ALSTON family of Minster, in Sheppey, and of the Friend family of Birchington. WILLIAM ALSTON of Rochester, a butcher and cow keeper, bought the Manor of Minster in Sheppey, with James Payne, in 1799, from the Trustees of Sir John Hayward's charity, as the result of an order of the Court of Chancery. In 1807 the Manor was sold to Charles Wyatt but Alston retained the seashore between Sheerness garrison and Scraps Gate with Cheyney Rock Oyster ground and the foreshore rights. Later he took a lease of a piece of ground adjoining the sea wall by Cheyney Rock Oyster ground and subsequently a house was built on it. The Alston family purchased the freehold of this piece of property in 1861. By the time of his death on 1833 William Alston was described as a merchant and had besides his original property in Rochester, a tannery and dwelling house at Chalkwell in Milton next Sittingbourne, which he bequeathed to his son William, and a dwelling house in Minster and oyster fisheries in Minster and in Prittelwell and Leigh in Essex, bequeathed to his sons David Thomas and David, oyster merchants of London who entered into partnership with a Portsmouth mariner with oyster beds near Portsmouth. The collection consists of title deeds, estate and legal papers for the Minster estate when it was administered by the trustees of Sir John Hayward's charity and of the Kent and Essex property of the Alston family etc. William Alston of Rochester Kent, his Oyster and other Businesses. During the late eighteenth and early nineteenth centuries William Alston of Kent was a well-known Thames estuary oyster merchant. He also owned several other business interests in the Sheppey area and was involved in civic affairs. Born at Prittlewell, Essex, William married Sarah Loader of Chatham in July 1785, at St Nicholas' Church Rochester. They set up home in High Street of the city, living there all their married lives; and it was here, between 1785 and 1800, that they raised their nine children. William Alston died in May 1833, aged 75 years and a widower. He was buried in St Nicholas' churchyard. It was from Rochester that William founded and developed his Sheppey based oyster fisheries and various other businesses, including a leather-making company [a tannery] at Sittingbourne. On his death, his three sons jointly inherited the firms he had founded but within months, due to the death of William Spice Alston, only two boys remained to run these businesses - David Thomas Alston and his younger brother, also David. Subsequently, by the 1860s, it would be the children of the older David who would be the main proprietors of the successful firms that their grandfather, William Alston of Rochester, had established. William and Sarah Alston also produced five daughters. The marriages of the three sisters who survived to adulthood were: Mary Ann to an M Smith of Kent; Elizabeth to William Chaplin MP for Salisbury and transport entrepreneur; and Catherine Alston to Sir Richard Dobson, Surgeon-General RN. The following brief account of William's business activity from about 1790 to his death summarizes two years' research into his life. This ongoing, family history project is hampered somewhat by distance; almost all details having to be acquired via internet websites, by some telephone contact, and also by vague memories of a family conversation many years ago. As yet very few visits been possible to discuss and view records in Kent libraries, archives and local history groups of which there are many. Alston oyster fisheries and the Isle of Sheppey foreshore. In the period 1790s up to early 1830s William Alston acquired, consolidated and expanded numerous oyster fisheries: he also founded a well-known sales stall at Billingsgate fish market, and a coal distribution depot. In addition, he owned some forty sail ships - mainly smacks and hoys, all registered at Rochester. These vessels worked principally in support of William's oyster business - Alston Oyster Fisheries. 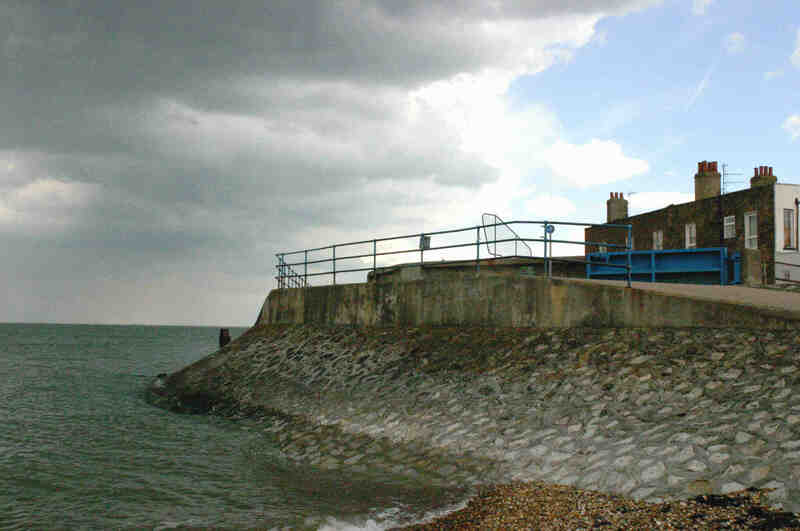 Also, close to his dredging depot near Sheerness, he built a pier. Alston's oyster grounds were located in the Thames estuary - two off south Essex, and several off north Kent. Along the Kentish shore William exploited the Cheyney Rock oyster beds off the Isle of Sheppey, together with other grounds in the east and west estuaries of the Swale. His Essex oyster beds lay in the shoals around Hadleigh Ray, the narrow channel that runs south of Leigh on Sea and east of Canvey Island. 'In 1799, William Alston of Rochester, butcher and cowkeeper [probably meaning a farmer raising cattle for slaughter] bought with one John Payne the Manor of Minster'. This estate was a considerable acquisition by the pair of businessmen. It was previously owned by Sir John Hayward and included the valuable oyster fishery rights off the estate shoreline which stretched from Garrison Point at Sheerness, east to Scrapsgate near Minster village. Part of the two-mile stretch of shoaling was known as the Cheyney Rock oyster ground, and was noted for the quality of the molluscs that bred there. Also, as joint lord of the Manor of Minster, William gained the valuable right to remove from the Minster foreshore unlimited quantities of sand, gravel, shingle and any other materials. Businessman Alston immediately set about exploiting his new assets - dredging and laying oysters for Billingsgate and other fish markets, and selling beach aggregate materials for industrial purposes. For William Alston, and later his sons, the removal of beach material in vast quantities [particularly copperas stone from Cheyney Rock to Barton Point] was to be highly profitable. However, their continual and highly contentious commercial activity would eventually lead to serious depletion of the foreshore and to major problems with the sea defences in front of Sheerness. After only a few years John Payne withdrew from his partnership with Alston, and subsequently, in 1807, William sold the manor, only retaining possession of the oyster grounds and the adjacent foreshore. In the early 1800s the demand for oysters in the south-east area was immense. For decades, annually from all dredging sources, literally hundreds of millions of oysters were sent to Billingsgate alone. The huge demand was driven by the oyster being a cheap sustenance for the poor, of which the rapidly expanding London area had tens of thousands. In time this need brought great pressure on the local east coast oyster fisheries in the Thames, Crouch and Blackwater estuaries, leading to merchants like Alston becoming increasingly reliant on the imported brood oyster. The mounting strain on Thames oyster stocks during this period was also due to excessive dredging, growing pollution and shellfish disease problems, and from extreme winters when estuary waters were frozen over. The smacks were the smallest of William's boats, typically between 10 and 30 tons burthen. Local dredgermen used these vessels for both dredging mature oysters [at about 4 years old] for dispatch to market, and for laying young brood oysters [about 2 years old] for fattening to maturity over a period of about eighteen months. His larger boats [two-masted hoys] would be used for dredging deep sea oysters, from the Dunkirk sand banks in the Strait of Dover to down-channel Jersey oyster grounds; and for carrying mature shellfish up Thames river to Billingsgate fish market. Eventually William would also use his hoys to bring immature oysters to his Thames estuary cultivating beds from fisheries in distant parts - from the Channel Islands and France, Cornwall, Wales, even from Irish waters. Like their Kentish and Essex cousins, these imported shellfish would eventually be shipped to Billingsgate quay as prime 'Milton Native' oysters. Dredging oysters would normally only take place for seven months in the year - September to March; the remaining months being those in which the oysters would need to lie undisturbed to fatten and mature. A haul of mature oysters would be graded in three sizes: the best [biggest] oysters were termed as 'Firsts'-these being the size of a man's hand. For the east coast dredgerman, the oyster trade was a tough and very demanding occupation; particularly in the deep winter months when, as now, bitter north and easterly winds would come off the North Sea and sweep across the wide, open waters of the Thames estuary. During William's lifetime the London oyster trade had become big business and by the 1830s one commentator was referring somewhat excessively to Alston's oysters enterprise as being no doubt the largest oyster farmer in the world'. Later, soon after William had died, journalists were speaking of his son David as being the very Rothschild of oyster-fishers. The pier and Cheyney Rock house. In 1803, on the Cheney Rock foreshore, William Alston constructed a pier. This was authorised for carrying away by ship: gravel, stones, ballast, sand or other materials'. The wording of the warrant for construction also allowed William to use the pier for dispatching his mature oysters to Billingsgate fish market and elsewhere, and for shipping in young, immature molluscs. The pier would also be used for his coal import business, which employed a leased area nearby as a coal depot yard. Nowadays, only a few short stubs of pier support timbers remain, visible at low tides and giving just a hint of the past industry of this place. Thirteen years later, Alston built a large property adjacent to his pier. At that time it was named as Cheyney Rock House and comprised a business complex with dwelling house. The former provided offices, numerous oyster preparation and packing areas, sheds, stables and carriage buildings. From 1816 William used this property as the administrative headquarters of his oyster fishery and marketing firm, not only for his north Kent business but also for his operations in south Essex. William's main home was in High Street, Rochester, and he would never reside at Cheyney Rock House: rather, it would become successively the homes of his two sons, David Thomas Alston and the younger David Alston. By the early twenties William owned three main residential properties: at High Street, St Nicholas' parish in the city of Rochester; the Cheyney Rock property; and Tannery House at Sittingbourne, part of his Chalkwell leather making business. He also owned numerous other properties in the Rochester district. The Sheerness property has been re-named Cheyney House and is now an English Heritage Grade II listed building, as is Tannery House at Sittingbourne. At the time Cheyney House was built, Alston was about 59 years of age; and his three sons, to whom he intended leaving his businesses on his death, were aged 20, 17 and 16 years. By the end of the Napoleonic War, all three boys had probably been employed for some time in one or more of their father's enterprises. And by this time old William had probably decided how his firms would be divided between his sons after his demise; and how he thought these businesses should be run thereafter. But early deaths and family disagreements would wreck William's master plan for his sons' futures. It was at the turn of the century that William Alston acquired the tannery complex at Chalkwell. Here, his workforce of about twenty-five men laboured at converting cattle and other animal hides into leather for selling to tradesmen; who would then produce a huge range of products for commercial, industrial and domestic uses. For William, and later his sons, the business was a very lucrative enterprise. The French Revolutionary war was at its height when William bought the tannery, a time when the demand for leather products was massive, especially from Britain's army and naval services. Thus this factory must have been working at full capacity throughout these years and was, it is known, for decades after. Each county contained many tanneries; but because of the extremely noxious and offensive smells, and deafening noises emanating from such manufacturies they were usually located at some distance from towns - as was the Chalkwell tannery in Kent. For the men labouring in these works, the long hours of each day would have been physically demanding in the extreme - little wonder was the industry often referred to as the worst that a man could find himself in! The death of William Alston - 1833. By the time of his death William Alston had become a very wealthy businessman and well-known in the off-shore shellfish fisheries industry. Annually he was sending, in barrels, some 50,000 bushels of oysters to Billingsgate fish market - this translating into about 14,500 tons of oysters per year. And in this period of fast population growth and industry in the south-east, Alston's tannery at Chalkwell remained highly profitable; as did his coal depot and aggregate supply businesses. Such success had been entirely due to William's great determination and drive, and his keen eye for an opportunity. Outside of commerce, he was a well respected citizen of Rochester where he had lived for 44 years; and where he had become a city Alderman. A widower, he died at his home, aged seventy-five years. William Alston's will was comprehensive and complex. It was dated April 1833,and was signed only weeks before his death in May of that year. The following is a brief outline of what is contained therein, but only the detail relevant to his three sons - William Spice Alston then 37, David Thomas Alston 34, and David Alston aged 33. Only the two Davids were married, both having children. The old man's will directed that his eldest son, William jnr would inherit the leather tannery at Chalkwell - a seven acre industrial site comprising a range of tanning process buildings together with the machinery they contained. The site also included a bark mill which produced the tannin acid used for treating the raw hides. The bequest embraced the Tannery House dwelling and its extensive gardens, the terrace of workers' cottages, an orchard, and several acres of land. Specifically, William directed his son to continue operating the tannery and, under threat of forfeiture, not to enter any co-partnership in this business. William jnr would also inherit a freehold plot of land in Cazenouve Street, Rochester. However, fate decreed that the young man would die in 1834, only fifteen months after his father's death; and so by the terms of William senior's will, the tannery would pass directly and solely to the brother, David Thomas Alston. William's will also directed that his two youngest sons, David Thomas Alston and David Alston would inherit, jointly, the Cheyney Rock oyster fishery business [Alston Oyster Fisheries] - all its oyster dredging and operations equipment, and associated buildings. This bequest would include his Essex fishery business - the Chalkwell Ouse, Leigh Swatch and Hadleigh Ray oyster grounds. And the pair would receive jointly his fleet of dredging smacks and hoys. From the Essex operation the younger David would inherit all 'carts, carriages, harnesses and horses'; just as the older David would receive similar items from the Cheyney Rock business. The aggregates and coal depot concerns would also pass to these two brothers, who would maintain control of all William's legacies for a further two decades. Alstons Oysters fifty years later. After William's death in 1833 the Alston Oyster Fisheries business would exist for a further half century. In 1856, William's grand-daughter Eliza Hole, then aged 26, became managing owner of the still successful company together with similar control of the coal depot [until 1875] and the beach aggregates interests of the firm. She was also principal shareholder of the Chalkwell tannery at Sittingbourne and a managing owner of the London based oyster merchants, Hole & Dodd. Eliza had inherited all but the latter of the these businesses from her late father David Thomas Alston, who had himself become sole managing owner of Alston Oyster Fisheries in 1842 following an acrimonious legal dispute with his younger brother David. Eliza Hole died in 1895 and by the turn of the century the Alston name had disappeared from Kent and London commercial directories. Thereafter, old William's descendents were connected only with the family's subsidiary company Hole & Dodd oyster merchants of Billingsgate and Cornwall. Finally, this business failed in 1927 due to severe recessionary times; thus ending, after some 130 years, the continuous family links to the oyster related businesses that William Alston of Rochester had founded. Ref: Researched and written by John Seagrove 2013. Archive centres: Kent History Centre, Maidstone, Kent; Cornwall Records Office, Truro; The National Archive, Kew; the Guildhall Library, London. Family and local history centres: Sittingbourne Heritage Museum; Sheerness Heritage Centre; Kent Family History Society; Cornwall Family History Society; East of London Family History Society. Authors: Derek Coombe: Fishermen from the Kentish Shore; Coombe, Hill & Wadham: The Bawleymen -Dredgermen of the River Medway; John R Philpots - Oysters and all about them; W Wildash: History and Antiquities of Rochester and its environs; James Murie: A Report on the sea fisheries and fishing industries in the Thames estuary; Aquafish Solutions: A Report to Seasalter Fisheries. Extract from Will of William Alston of Rochester Kent merchant dated 21 Apr 1833 is a 19 page document in which William sets out a complex process for the control of and distribution of his substantial estate. The two main portions of the estate are put in trust with his executors Messrs D H Day, D B Day, and T H Day Bankers of Rochester. The Messuages Tenements Lands Buildings, including a tannery and all the requirements of such a business, with and all their appurtenances in Chalkwell in the parish of Milton by Sittingbourne Kent, in favour of his son William Spice Alston his heirs child or children. He is directed to succeed to and continue the tanning business and is specifically directed not to enter into any co-partnership with any person at risk of forfeiture of the asset. This is the last Will and Testament of me William Alston of the city of Rochester in the county of Kent Merchant made published and declared the twenty first day of April in the year of our Lord one thousand eight hundred and thirty three in manner following that is to say First I give and devise all those my freehold messuage or Tenement and tan yard with the Pits cottages barns Stables warehouses Storehouses Shops [or Ships] Sheds lodges bark mills with the gear thereof and all other erections and buildings in the same tan yard or pertaining thereto and used therewith the Garden containing one acre or thereabouts in front of the said Messuage the Orchard containing two acres or thereabouts with the Stable and other buildings thereon and the field adjoining or near the said tan yard containing three Acres or thereabouts with the Shed and other buildings thereon all which premises are situate at or near Chalkwell in the parish of Milton next Sittingbourne in the county of Kent and are now in my own occupation [marginal note: interlined in original] with their and every of their rights members and Appurtenances unto David Hermitage Day David John Day and Thomas Hermitage Day all of the city of Rochester aforesaid Bankers their heirs and assigns to the uses and for the purposes hereinafter mentioned that is To say to the use of my son William Spice Alston and his assigns for and during the term of his natural life without impeachment of waste And from and after his decease to the use of all and every the Child and Children as well daughters and sons of the said William Spice Alston equally to be divided between them if more than one as tenants in common and not as joint tenants and if their shall be but one such child then to the use of such only Child and the heirs and assigns of such Child or children respectively for ever And in case any one or more of such Children shall happen to die under the age of twenty one years and without leaving lawful issue living at the time of his her or their death or respective deaths then as to all and every the original part or share parts or shares of the Child or Children so dying and also the part or share parts or shares [marginal note: interlined in original] which shall be taken by him her or them under this present provision or limitation in the nature of Cross remainders To the use of the surviving or other Child or Children of the said William Spice Aston equally to be divided between them if more than one as tenants in common and not as joint tenants and his her or their heirs and Assigns for ever And if there shall not be any Child of the said William Spice Alston or in case of there being one or more such Child or Children and of the decease of all of them happening under the age of twenty one years without leaving issue as aforesaid Then to the use of my Son David Thomas Alston and his assigns for and during the term of his natural life without impeachment of waste And from and after his decease to the use of all and every the Child and Children as well daughters as sons of the said David Thomas Alston and his her or their respective heirs in like manner for the like Estates and interests and with like benefit of Survivorship and ?accrual? mutatis mutandis as are hereinbefore mentioned and contained in relation to the Children of my said Son William Spice Alston And if there shall not be any Child of the said David Thomas Alston or in case of there being on[e] or more such Child or Children and of the decease of all of them happening under the age of twenty one years without leaving issue as aforesaid Then to the use of my Son David Alston and his assigns for and during the term of his natural life without impeachment of waste and from and after his decease To the use of all and every the Child and Children as well daughters as sons of the said David Alston and his her or their respective heirs in like manner for the like Estates and interests and with like benefit of Survivorship and ?Accrual? mutatis mutandis as are hereinbefore mentioned and contained in relation to the Children of my said Son William Spice Alston And if there shall not be any Child of the said David Alston or in case of there being one or more such Child or Children and of the decease of all of them happening under the age of twenty one years without leaving issue as aforesaid Then to the use of my own right heirs for ever Provided always and forasmuch as it is my Will and desire that my Son William Spice Alston should not join or engage in Copartnership with any person or persons whomsoever in the Manufactory Trade or business of a Tanner And I do hereby declare and direct that in case he shall at any time after my decease join or engage in Copartnership with any person or persons whomsoever in the said manufactory trade or business of a Tanner then and from thenceforth during the residue of the natural life of my said Son William Spice Alston they the said David Hermitage Day David John Day and Thomas Hermitage Day their heirs and assigns shall become and stand seized and possessed of all and singular the hereditaments hereinbefore devised or . . . . . to the use of the said William Spice Alston for his life as to such interest and interests for life of the said William Spice Alston to the use of themselves their Executors and Administrators in trust to pay and apply the rents issues and profits thereof to or for the benefit of the person or persons to whom or for whose benefit the same would from time to time be payable or applicable in case the said William Spice Alston were then actually dead And I give and devise all that piece or Parcel of Freehold ground containing in length one hundred and thirty four feet or thereabouts be the same more or less with the rights members and appurtenances thereto belonging situate in Cazenouve Street in the Parish of Saint Margaret next Rochester aforesaid and near the Public Alehouse there known by the Sign of the Sir John Falstaff unto and to the use of my said Son William Spice Alston his heirs and Assigns for ever And I give and devise all those my Freehold lands grounds sea shore and fishery commonly called Cheney Rock situate in the Parish of Minster in the Isle of Sheppy in the County of Kent and all my lands grounds tenements soil and Rights of Soil fisheries and rights of Fishery and all other rights easements liberties and hereditaments whatsoever of and within the Manor of Minster in the said Isle of Sheppy shares and Products thereof and all other my manors lands tenements and hereditaments whatsoever within the said Parish and Manor of Minster or elsewhere in the said Isle of Sheppy and in or on the shores Creeks and waters thereof with their and every of their rights members & appurt[enance]s And also all those my Freehold lands grounds Sea Shores and fisheries commonly called Leigh Swatch and Chalkwell Ouse situate in the parishes of Prittlewell & Leigh or one of them in the County of Essex and all my Freehold manors lands grounds tenements soil and rights of Soil fisheries and rights of Fishery and all other rights easements liberties and hereditaments whatsoever within the said parishes of Prittlewell and Leigh or elsewhere in the said County of Essex and in or on the Sea Shores creeks and waters thereof with their and every of their rights members and appurtenances And also all those my Freehold messuages or tenements buildings land and hereditaments whatsoever situate in the High Street and in Bull Lane or elsewhere within the parish of Saint Nicholas in the City of Rochester aforesaid with their and every of their rights members and appurt[enance]s unto the said David Hermitage Day David John Day and Thomas Hermitage Day their heirs and assigns To the uses and for the purposes hereinafter mentioned that is to say As to and concerning one full and equal undivided moiety or half part of and in the said last devised estates and hereditaments (the whole into two equal parts being divided or considered as divided) To the use of my Son David Thomas Alston and his assigns for and during the term of his natural life without impeachment of waste And from and after his decease in case he shall depart this life leaving my Sons William Spice Alston and David Alston both him surviving To the use of my Son William Spice Alston and his Assigns for and during the term of his natural life without impeachment of waste And from and after the decease of the said William Spice Alston in case the limitation to him for life last hereinbefore contained shall take effect and if the same shall not take effect then from and after the decease of the said David Thomas Alston [marginal note: Original] To the use of all and every the Son and Sons of the said David Thomas Alston equally to be divided between them if more than one as tenants in common and not as joint tenants and if there shall be but one such Son then to the use of such only Son and the heirs and Assigns of such Son or Sons respectively for ever And in case any one or more of such Sons of the said David Thomas Alston shall happen to die under the age of twenty one years and without leaving lawful issue living at the time of his or their death or respective deaths then as to all and every the original part or share parts or shares of the Son or Sons so dying and also the part or share parts or shares which shall be taken by him or them under this present provision or limitation in the nature of cross remainders To the use of the surviving or other Son or Sons of the said David Thomas Alston equally to be divided between them if more than one as tenants in common and not as joint tenants and his or their heirs and assigns for ever And if there shall not be any Son of the said David Thomas Alston or in case of there being one or more such Son or Sons and on the decease of all of them happening under the age of twenty one years without leaving issue as aforesaid Then to the use of my said Son David Alston and his assigns for and during the term of his natural life without impeachment of waste And from and after his decease To the use of all and every the Son and Sons of the said David Alston and his or their respective heirs in like manner for like estates and interests and with like benefit of Survivorship and ?accruer? mutatis mutandis as are last hereinbefore mentioned and contained in relation to the Son and Sons of my said Son David Thomas Alston And as to and concerning the other or remaining full and equal undivided moiety or half part of and in the said estates and hereditaments last devised and now in limitation To the use of my Son David Alston and his Assigns for and during the term of his natural life without impeachment of waste and from and after his decease in case he shall depart this life leaving my said Sons William Spice Alston and David Thomas Alston both him surviving To the use of my said Son William Spice Alston and his assigns for and during the term of his natural life without impeachment of waste and from and after the decease of the said William Spice Alston in case the limitation to him for life last hereinbefore mentioned shall take effect and if the same shall not take Effect then from and after the decease of the said David Alston [marginal note: Original] To the use of ?and benefit of? the Son and Sons of the said David Alston [marginal note: interlined] and his or their respective heirs in like manner for like Estates and interests and with like benefit of Survivorship and ?accruer? mutatis mutandis as are last hereinbefore mentioned and contained in relation to the Son and Sons of my said Son David Thomas Alston And if there shall not be any Son of the said David Alston or in case of there being one or more such Son or Sons and of the decease of all of them happening under the age of twenty one years and without leaving issue as aforesaid Then to the use of my said Son David Thomas Alston and his assigns for and during the term of his natural life without impeachment of waste and from and after his decease To the use of all and every the Son and Sons of the said David Thomas Alston and his or their respective heirs in like manner for like estates and interests and with like benefit of Survivorship & ?accruer? mutatis mutandis as are last hereinbefore mentioned and contained in relation to their Son and Sons of him the said David Thomas Alston and if there shall not be any Son of either of them the said David Thomas Alston and David Alston [marginal note: interlined] or in case of there being one or more such Son or Sons and of the decease of all of them happening under the age of twenty one years without leaving issue as aforesaid Then as to the entirety of the said Estates and hereditaments last devised and now in limitation To the use of my Son William Spice Alston and his assigns for and during the term of his natural life without impeachment of waste And from and after his decease to the use of all and every the Son and Sons of the said William Spice Alston and his or their respective heirs in like manner for like Estates and interests and with like benefit of survivorship and ?accruer? mutatis mutandis as are last hereinbefore mentioned and contained in relation to the Son and Sons of my said Son David Thomas Alston And if there shall not be any Son of the said William Spice Alston or in case of there being one or more such Son or Sons & of the decease of all of them happening under the age of twenty one years without leaving issue as aforesaid Then to the use of my Grandson William Augustus Chaplin (Son of my Daughter Elizabeth Chaplin) and his assigns for and during the term of his natural life without impeachment of waste and from and after his decease To the use of all and every the Son or Sons of the said William Augustus Chaplin and his or their respective heirs in like manner for like estates and interests with like benefit of survivorship and ?accruer? mutatis mutandis as are last hereinbefore mentioned in relation to the Son and Sons of my said son David Thomas Alston and [if] there shall not be any Son of the said William Augustus Chaplin or in case of there being one or more such Son or Sons and of the decease of all of them happening under the age of twenty one years without leaving issue as aforesaid [marginal note: Original] Then as to and concerning on full undivided moiety or half part (the whole into two equal parts being divided or considered as divided) of and in the said Estates and hereditaments last devised and now in limitation To the use of my Grandson Horace Chaplin (another of the Sons of my said Daughter Elizabeth Chaplin) and his assigns for and during the term of his natural life without impeachment of waste and from and after his decease To the use of all and every the Son and Sons of the said Horace Chaplin and his or their respective heirs in like manner for like Estates and interests and with the like benefit of survivorship and ?accruer? mutatis mutandis as are last hereinbefore mentioned in relation to the Son and Sons of my said Son David Thomas Alston and if there shall not be any Son of the said Horace Chaplin or in case of there being one or more such Son or Sons and of the decease of all of them happening under the age of twenty one years without leaving issue as aforesaid then to the use of my Grandson Alfred Chaplin (another of the Sons of my said Daughter Elizabeth Chaplin) and his assigns for and during the term of his natural life without impeachment of waste And form and after his decease To the use of all and every the Son and Sons of the said Alfred Chaplin and his or their respective heirs in like manner for like Estates interests and with like benefits of Survivorship and ?accruer? mutatis mutandis as are last hereinbefore mentioned and contained in relation to the Son and Sons of my said Son David Thomas Alston And as to and concerning the other full undivided moiety or half part (the whole into two equal parts being divided or considered as divided as aforesaid) of and in the said estates and hereditaments last devised and now in limitation To the use of my said Grandson Alfred Chaplin and his assigns for and during the term of his natural life without impeachment of waste and from and after his decease To the use of all and every the son and sons of the said Alfred Chaplin and his or their respective heirs in like manner for like estates and interests and with like benefit of Survivorship and ?accruer? mutatis mutandis as are last hereinbefore mentioned and contained in relation to the Son and Sons of my said Son David Thomas Alston And if there shall not be any Son of the said Alfred Chaplin or in case of there being one or more such Son or Sons and of the decease of all of them happening under the age of twenty one years without leaving issue as aforesaid Then to the use of the said Horace Chaplin & his assigns for and during the term of his natural life without impeachment of waste And from and after his decease To the use of all and every the Son and Sons of the said Horace Chaplin and his or their respective heirs in like manner for like Estates and interests and with like benefit of survivorship & ?accruer? mutatis mutandis as are last hereinbefore mentioned and contained in relation to the son and Sons of my said Son David Thomas Alston And if there shall not be any Son of either of them the said Horace Chaplin and Alfred Chaplin or in case of there being one or more such Son or Sons and of the decease of all of them happening under the age of twenty one years without leaving issue as aforesaid Then as to the entirety of the said Estates and hereditaments last devised and now in limitation To the use of my own right heirs for ever And I give and bequeath unto the said David Hermitage Day David John Day and Thomas Hermitage Day the Executors Adm[inistrat]ors and Assigns All those my leasehold Messuages or tenements and other buildings ground and premises with the Appurt[enance]s situate at or near Cheney Rock in the Parish of Minster in the Isle of Sheppy aforesaid and now in the occupation of myself and others for all the term and with all the right and benefit of renewal which I shall be entitled to therein at the time of my decease Upon Trust for and for the benefit of the same persons in the same proportions for like interests and under and subject to the same powers provisos limitations restrictions and regulations in all respects as are hereinbefore and hereinafter mentioned expressed and declared of concerning and in relation to the before mentioned and devised freehold hereditaments situate in the Parish of Minster and Isle of Sheppy hereinbefore limited to or to the use of my said Sons David Thomas Alston and David Alston in undivided moieties for their respective lives with divers remainders over or as near thereto as the nature of the same estates and the rules of Law and equity will admit and to permit and suffer the persons for the time being respectively entitled under the uses limitations and trusts aforesaid to the rents and profits of the said Freehold hereditaments in the said Parish of Minster and Isle of Sheppy respectively in the life proportions to have hold and enjoy and receive and take the rents and profits of the same leasehold premises or to pay and apply the same to or for the benefit of such persons accordingly And I direct that the lease under which I hold the same leasehold premises shall be kept duly renewed so often as the same shall according to the terms and conditions thereof become renewable and that the fines fees and expenses attending such renewals shall be paid out of the rents and profits of the same Premises provided always and I hereby declare and direct that in case my Sons William Spice Alston David Thomas Alston and David Alston or my Grandchildren William Augustus Chaplin Horace Chaplin and Alfred Chaplin or any or either of them shall happen to become Bankrupt or shall take the benefit of any act or Acts of Parliament passed or to be passed for the relief of insolvent debtors then from the time or respective times that a fiat or fiats in Bankruptcy shall issue against my said Sons or Grandchildren or any one or more of them respectively or from the time of any one or more of them so taking the benefit of any such Insolvent Act and during the then remainder of his or their life or respective natural lives the interest and interests for life by this my will limited to or to the use of such of my said Sons or Grandchildren respectively who shall so become bankrupt and against whom a fiat or fiats in Bankruptcy shall so issue or who shall so take the benefit of any such Insolvent Act in my real Estates or any part or parts thereof or in my Leasehold estates or any part or parts thereof shall cease and determine and the Trustees to whom the same real or leasehold estates respectively are hereinbefore devised and bequeathed and their heirs Executors Adm[inistrat]ors and Assigns shall thenceforth stand and be seized and possessed thereof as to such interest and interests for life of such of my said Sons or Grandchildren respectively who shall so become Bankrupt and against whom a fiat or fiats in Bankruptcy shall so issue or who shall so take the benefit of any such Insolvent Act to the use of them the said Trustees their Executors and Administrators [marginal note: Interlined in original] upon trust during the remainder of the natural life or lives of such Son or Sons Grandchild or Grandchildren respectively so becoming Bankrupt and against whom a fiat or fiats in Bankruptcy shall so issue or who shall so take the benefit of any such Insolvent Act to pay apply and dispose of the annual income proceeds and profits thereof as the same arise & . . . . . due to or for the benefit of the same persons as for the time being and from time to time would under the limitations of this my will be entitled thereto in case my said Son or Sons Grandchild or Grandchildren respectively so becoming Bankrupt and against whom a fiat or fiats in Bankruptcy shall so issue or who shall so take the benefit of such Insolvent Act was or were naturally dead And to preserve the contingent estates interests and remainders hereinbefore limited from being defeated and destroyed I give and devise the hereditaments and part or Shares hereinbefore devised or limited to any and every person for life as aforesaid after the determination of that Estate by forfeiture or otherwise in his or her lifetime to the said David Hermitage Day David John Day and Thomas Hermitage Day and their heirs during the life of every tenant for life whose Estate shall so determine in trust for him or her and by the such ways and means to preserve the contingent Estates interests or remainders expected thereon And I give and bequeath all those my leasehold Oyster Grounds Fishery & Premises with the Appurtenances called Hadleigh ?Roa? situate at or near Leigh aforesaid and all other Premises if any held by me of Lady Sparrow and all other my leasehold Oyster Grounds and Fisheries with the Appurtenances for all the terms estate and interest which I shall be entitled to therein respectively at the time of my decease unto my said Sons David Thomas Alston and David Alston equally to be divided between them share and share alike as tenants in common and not as joint tenants and their respective Executors Adm[inistrat]ors and Assigns absolutely And I give and bequeath such Chariot and Chariot Horses as I shall have in use at the time of my decease unto my said Son David Thomas Alston absolutely Also I give and bequeath all my silver plate and all the wines and other liquors which shall be in or at my dwellinghouse in Rochester aforesaid at the time of my decease unto and equally between my said Sons William Spice Alston & and David Thomas Alston absolutely Also I give and bequeath all the household furniture and implements of household china and other household effects (other than plate wine and other liquors [)]which shall be in and about my said dwellinghouse in Rochester aforesaid at the time of my decease unto my said Son William Spice Alston absolutely. Also I give and bequeath all the household Furniture and implements of household ?use? linen China and other household Effects and all the liquors and provisions which shall be in and about my dwelling house at Chalkwell in the Parish of Milton aforesaid at the time of my decease unto my said Son William Spice Alston absolutely [marginal note: Interlined in original] Also I give and bequeath all the household Furniture and implements of household plate linen China and other household Effects and all the liquors and provisions which shall be in and about my dwelling house at or near Cheney Rock in the Parish of Minster aforesaid at the time of my decease unto my Son David Thomas Alston absolutely And I do hereby direct that the Stoves and other fixtures which shall be in and about my several dwellinghouses at Rochester Chalkwell and Minster aforesaid at the time of my decease shall remain and be left therein for the benefit of the person or persons to be for the time being entitled in possession to the same Premises under the devises bequests & provisions herein contained Also I give and bequeath all and every the Carts and other Carriages horses harness Fixtures and implements which shall pertain to and be used in my manufactory trade or business as a Tanner at the time of my decease unto my said Son William Spice Alston absolutely Also I give and bequeath all and every my vessels boats and craft whatsoever with the tackle Furniture fixtures materials implements and appurtenances to the same vessels boats and craft severally belonging or appertaining and as they at the time of my decease may be fitted and used for the Oyster trade or business and all my dredges with the Chains and buoys thereto and all the rakes and other materials and implements whatsoever which at my decease shall be in use in or for the purposes of or in any way pertain to all or any of my Oyster grounds and Fisheries or my trade & business of an Oyster Merchant unto and equally between my said Sons David Thomas Alston and David Alston absolutely And I give and bequeath unto the said David Hermitage Day David John Day and Thomas Hermitage Day and my said Son David Thomas Alston their Executors and Adm[inistrat]ors the Sum of five thousand pounds sterling (of which the Sum of one thousand pounds now owing to me from William Chaplin the Husband of my daughter Elizabeth Chaplin or so much thereof as shall remain unpaid at the time of my decease shall form part) to be by them laid out and invested in the purchase of Stock in their names in the three per centum consolidated Bank Annuities which Stock they shall stand and be possessed of upon the trusts and for the intents and purposes hereinafter mentioned that is to say Upon trust that they the said David Hermitage Day David John Day Thomas Hermitage Day and David Thomas Alston and the Survivors and Survivor of them and the Executors Adm[inistrat]ors and Assigns of such Survivor do and shall during the life of my Daughter Elizabeth Chaplin pay and dispose of the interest dividends & annual produce and in such parts and proportions manner and form as my said Daughter Elizabeth Chaplin shall from time to time whether covert or solo and notwithstanding her present or any future coverture by any writing or writings under her own hand only as the interest dividends and annual produce shall from time to time become due and payable but not by way of anticipation direct or appoint or otherwise do and shall pay the same interest dividends & annual produce into the Proper hands of my said daughter Elizabeth Chaplin To the intent that the same may not be assigned charged or disposed of and may not be at the disposal for o subject or liable to the controul (sic) debts or engagements of her present or any future husband but only at her own sole and separate disposal And I hereby declare that the receipts in writing of my said Daughter Elizabeth Chaplin alone or of the person or persons to whom she shall direct the said interest dividends and annual produce to be paid shall from time to time notwithstanding her present or any future coverture be sufficient discharges to the person or persons who shall pay the same for so much thereof for which every such receipt shall be given And from and after her decease my said Trustees or the Survivors or Survivor of them or the executors Administrators or assigns of such Survivor shall stand and be possessed of and interested in the Principal of the said three per centum annuities to be purchased as aforesaid Upon trust for all or such one or more of the Children of my said daughter Elizabeth Chaplin for such interest or interests & in such shares proportions manner and form as my said daughter Elizabeth Chaplin whether covert or sole and notwithstanding her present or any future coverture by any deed or deeds writing or writings with or without power of revocation and new appointment to be by her sealed and delivered in the presence of one two or more credible witness or witnesses or by her last will and Testament in writing or any Codicil thereto or any writing in the nature of or purporting to be her last will and Testament or Codicil to be by her (notwithstanding her present or any future Coverture signed and published in the presence of and attested by two or more Credible Witnesses shall direct limit or appoint give or bequeath the same And in default of such direction limitation or appointment gift or bequest and as to so much and such part and parts of the said three per centum Annuities to be purchased as aforesaid to which any such direction limitation or appointment gift or bequest as may be made shall not extend Upon trust that my said Trustees or the Survivors or Survivor of them or the Executors Adm[inistrat]ors or Assigns of such Survivor do and shall pay assign and transfer the same unto all and every the Child and Children of the said Elizabeth Chaplin equally to be divided between them if more than one share and share alike and if there shall be but one such Child then the whole to such only Child and his her or their several and respective Executors Adm[inistrat]ors and Assigns upon their severally attaining the age of twenty five years and after the decease of the said Elizabeth Chaplin as aforesaid to and for his her or their own absolute use and benefit The share or respective shares of such Child or Children to become vested and transferable interests in them respectively (expectant on the decease of the said Elizabeth Chaplin) when and as he she or they respectively shall attain the said age of twenty five years or die under that age leaving lawful issue living at their respective deaths But in case ant one or more of the Children of the said Elizabeth Chaplin shall happen to die under the age of twenty five years and without leaving lawful issue as aforesaid then the part and share or parts and shares as well original as accruing of and in the said three per centum annuities to be purchased as aforesaid or of and in so much and such part thereof as is now in disposition or limitation of such Child or children so dying shall go and accrue unto the other or others of her said Children equally to be divided between them if more than one share and share alike and if there shall be but one then to such only one and become vested interests in and be payable assignable and transferable to him her or them respectively at the same time or times as their his or her original shares or share Provided always and I do hereby declare and direct that after the decease of my said Daughter Elizabeth Chaplin during the respective minorities of her said children and until they severally attain the said age of twenty five years the dividends interest and annual produce of their respective apparent or presumptive shares of and in the said three per centum annuities to be purchased as aforesaid shall from time to time be laid out and invested in the purchase of like three per centum annuities as shall also the increased dividends to arise from such further investments in increase and accumulation of the principal of their said respective shares Provided also and I hereby declare and direct that my said Trustees shall not call for or require payment by the said William Chaplin of the Principal of the said Sum of one thousand pounds or so much thereof as shall remain due and unpaid at the time of my decease at any earlier period or in any other manner than by six yearly instalments each of one sixth part of the same debt computing from the day of my decease And I hereby give foregive and release unto the said William Chaplin all such sum and sums of money if any over and above the Sum of one thousand pounds as he may owe or stand indebted unto me at the time of my decease Also I give and bequeath unto the said David Hermitage Day David John Day Thomas Hermitage Day and David Thomas Alston their Executors and Administrators the further Sum of one thousand pounds sterling to be by them laid out and invested in the purchase of Capital Stock in their names in three per centum consolidated Bank Annuities which last mentioned stock they shall stand and be possessed of upon the trusts and for the intents and purposes hereinafter mentioned that is to say Upon trust that my said Trustees or the Survivors or Survivor of them of the Executors Adm[inistrat]ors or Assigns of such Survivor do and shall pay assign & transfer the same last mentioned three per centum annuities unto my Grand daughter Eleanor Chaplin (one of the Children of my said Daughter Elizabeth Chaplin) upon her attaining the age of twenty two years and I declare and direct that the same shall become a vested and transferable interest in the said Eleanor Chaplin upon her attaining the said age of twenty two years or dying under that age leaving lawful issue living at the time of her death And in case of the decease of the said Eleanor Chaplin under the said age of twenty two years and without leaving lawful issue as aforesaid Then upon trust that they my said Trustees and the Survivors and Survivor of them and the Executors Administrators and Assigns of such Survivor shall and dod pay apply assign and dispose of the said three per centum annuities to be purchased with the said Sum of one thousand pounds as aforesaid and the dividends interest and produce thereof to or for the benefit of my said Daughter Elizabeth Chaplin and her other Children in like manner and under and subject to like or similar power of appointment and of the regulations provisions directions limitations and powers in all respects mutatis mutandis as are hereinbefore mentioned and contained in relation to the three per Centum Annuities to be purchased with the said Sum of five thousand pounds and the dividends interest and produce thereof hereinbefore given or limited to or in trust for the said Elizabeth Chaplin and her Children Provided always And I do hereby declare and direct that during the minority of the said Eleanor Chaplin and until she shall attain the age of twenty two years the dividends interest and annual produce of the said three per Centum Annuities to be purchased with the said Sum of one thousand pounds as aforesaid shall be laid out and applied in for and towards her maintenance education and support or otherwise for the benefit in such way as my said Trustees shall think fit Also I give and bequeath unto the said David Hermitage Day David John Day Thomas Hermitage Day and David Thomas Alston their Executors and Administrators the further Sum of one thousand pounds sterling to be by them laid out and invested in the purchase of Capital Stock in their names in three per cent consolidated Bank Annuities which last mentioned stock they shall stand and be possessed of upon the trusts and for the intents and purposes hereinafter mentioned that is to say Upon trust that my said Trustees or the Survivors and Survivor of them or the Executors Adm[inistrat]ors or Assigns of such Survivor do and shall pay assign and transfer the same last mentioned three per cent annuities unto my Grandson William Francis Dobson (Son of my late Daughter Catherine Dobson deceased) upon his attaining the age of twenty five years and I declare and direct that the same shall become a vested and transferable interest in the said William Francis Dobson upon his attaining the said age of twenty five years or dying under that age leaving lawful issue living at the time of his death And in case of the decease of the said William Francis Dobson under the said age of twenty five years and without leaving lawful issue as aforesaid Then I declare and direct that the said last mentioned three per Cent Annuities shall fall into and become part of the residue of my personal Estate and be assigned transferred and disposed of by my said Trustees accordingly Provided always and I do hereby declare and direct that during the minority of the said William Francis Dobson and until he shall attain the age of twenty five years or die under that age the dividends interest and annual produce of the said last mentioned three per cent annuities shall from time to time be laid out and invested in the purchase of like three per cent annuities as shall also the increased dividends to arise from such further investments in increase and accumulation of the principal of the same last mentioned three per cent annuities for the benefit of the person or persons who under the trusts and limitations hereinbefore contained may become entitled thereto Provided always and I do hereby direct that the said legacies or Sums of five thousand pounds one thousand pounds and one thousand pounds hereinbefore directed to be laid out and invested by the Trustees of this my Will in the purchase of the three per Cent consolidated Bank Annuities shall be so laid out and invested by them at such convenient time or times within six years next after my decease as the Executors and Trustees of this my will shall think fit but so that until such investments shall be fully made not less than one sixth part of the said legacies shall be so laid out and invested in each of the said six years next after my decease and I direct that in the mean time and until such investments shall be made interest at the rate of five pounds per centum per annum computed from the day of my decease shall be paid upon the same legacies or so much thereof as from time to time shall remain uninvested as aforesaid which interest shall be paid applied and disposed of in like manner as the dividends or interest of the three per Cent Stock to be purchased as aforesaid would have been in case the same had been previously purchased And I bequeath to my Servant Lucy Wakefield the Sum of two hundred pounds to be paid to her within one month next after my decease [marginal note: interlined] And whereas I have made and executed a settlement of certain Freehold Estates to ?certain? uses for the benefit of my Dau[ghte]r Mary Ann Smith (the wife of Charles Smith) after my decease by Indentures of lease and release bearing date respectively the nineteenth and twentieth days of this instant month of April the lease being of the latter date and made between me of the first part the said Charles smith and Mary Ann his Wife of the second part and my said Sons William Spice Alston and David Thomas Alston of the third part Now I do hereby ratify and confirm the said Indentures of Lease and release and settlement and do expressly direct my Sons and all other persons and parties to do and execute all acts and things whatsoever which are or may become necessary for the confirmation and corroboration thereof and the giving complete legal effect to the same and the uses trusts and limitations therein contained And I give and bequeath all and every of my ready money and securities for money monies in the public Stocks or funds debts notes leases stock in trade as a Tanner and Oyster Merchant Goods Chattels and personal Estate and Effects whatsoever and of what nature or kind soever not hereinbefore Specifically bequeathed or disposed of (after and subject to the payment or discharge thereout of all my just debts the pecuniary legacies hereinbefore bequeathed and payments hereinbefore directed to be made and my funeral and testamentary expenses) unto my said Sons William Spice Alston David Thomas Alston and David Alston equally to be divided between them share and share alike and their respective Executors Adm[inistrat]ors and Assigns absolutely And I hereby declare and direct that my said Son William Spice Alston shall at my decease succeed to and continue for his own use and benefit my manufactory trade or business of a Tanner carried on at Chalkwell in the Parish of Milton aforesaid and shall be entitled to become the purchaser of the leather bark and other Stock pertaining to the said Manufactory trade or business at the time of my decease(other than the carts and other carriages horses harness fixtures and implements hereinbefore bequeathed to him) at such price or Sum of money as the same shall be valued and appraised at by two indifferent and Proper persons one to be nominated by the Executors of this my will and the other by my said Son William Spice Alston and in case such referees should disagree then by a proper and indifferent third person to be nominated by such Referees as umpire And which valuation I direct shall be made as soon as conveniently may be after my decease And I further declare and direct that my said Sons David Thomas Alston and David Alston shall at my decease succeed to and continue for their own use and benefit equally my trade or business of an Oyster Merchant carried on at or upon the aforesaid Oyster Beds grounds or layings called Cheyney Rock Chalkwell Ouze Leigh Swatch and Hadleigh ?Rea? situate at or near Minster Leigh and Prittlewell aforesaid and at or upon any other Oyster Beds Grounds or layings which may be in my occupation at the time of my decease whether carried on by me alone or in connexion with any other person or persons at the time of my decease and shall be entitled to become the Purchasers of the Stock of Oysters and Oyster Brood thereon at the time of my decease at such prices or Sums of money as the same shall be valued and appraised at by two indifferent and proper persons one to be nominated by my said Sons David Thomas Alston and David Alston and the other by the other Executors of this my Will or by my said Son William Spice Alston and in case such referees should disagree then by a proper and indifferent third person to be nominated by such referees as Umpire And which valuations I direct shall be made as soon as conveniently may be after my decease And I hereby declare that the Stock pertaining to my said manufactory trade or business of a tanner hereinbefore directed to be valued and appraised and the Stock of Oysters and Oyster brood on the several Oyster Beds grounds or layings which shall be in my possession use or occupation at the time of my decease shall be and constitute parts of my residuary personal Estate subject nevertheless to such application of the same in or towards payment of the legacies or Sums of money hereby bequeathed as is hereinbefore directed And I further declare and direct that my said Sons William Spice Alston David Thomas Alston and David Alston shall respectively pay into the fund of my residuary personal Estate so much and such part of the valuations and appraisements hereinbefore directed to be made for them as aforesaid as from time to time shall be wanted for payment of the several legacies and other charges payable thereout and as may be necessary to actualize their respective portions shares of my residuary personal Estate And I give devise and bequeath unto the said David Hermitage Day David John Day Thomas Hermitage Day and David Thomas Alston their heirs executors Adm[inistrat]ors and Assigns all such freehold and leasehold messuages lands tenements and hereditaments whatsoever (if any) as are now vested in me or as to the said leasehold Premises which shall be vested in me at the time of my decease either as Trustee or by mortgagee in any way howsoever To hold the same unto and to the use of the said David Hermitage Day David John Day Thomas Hermitage Day and David Thomas Alston theirs heirs Executors Adm[inistrat]ors and Assigns upon and subject to the like trusts and equity of redemption upon and subject to which the same premises are now or shall be vested in me and with the same powers and . . . . . as far as I can devise or bequeath the same or I have or may be entitled to in and over the same premises respectively the monies due to me on any such mortgages to be nevertheless considered as part of my personal Estate and . . . . . the dispositions of this my Will provided always and I do declare and direct that on the death of any trustee or trustees of or under this my Will or of any trustee or trustees to be appointed pursuant to this provision or in case any one or more of them shall desire to decline or be discharged from the trusts thereof or shall become incapable or unfit to act therein or shall go to reside beyond Sea or shall desire to have an additional Trustee or Trustee joined with them or any of them in the same trusts then and in any or either of the said cases and so often as any or either of them shall happen it shall and may be lawful for the surviving or continuing and acting Trustees or Trustee or the heirs executors or Adm[inistrat]ors of the last acting Trustee or if there shall be no remaining Trustee then for my said Sons William Spice Alston David Thomas Alston and David Alston to nominate and appoint new Trustees or a new Trustee in the room of those so respectively dead or declining or becoming incapable or unfit to act or going to reside beyond Sea or to act as additional Trustee or additional Trustees And that immediately on or after every such appointment the trust Estates Stocks monies and Premises then remaining undisposed of pursuant of the Provisions of this my Will shall be conveyed assigned and transferred so and is such manner that the surviving or continuing trustees or trustee and such new or additional Trustees or Trustee may jointly or such new Trustees if the case shall so require may solely to them their heirs Executors Adm[inistrat]ors and Assigns become and stand seized and possessed thereof to the uses and upon the trusts of this my Will or such of them as shall be then subsisting undetermined and capable of taking effect and every such new or additional trustee shall have and may exercise the like privileges (sic) powers and authorities in all respects as if he had been originally appointed a Trustee of and by this my will Provided also and I do declare and direct that it shall be lawful for the Executors of this my will to compound for and compromise any debt or debts that may be due to me at the time of my decease or that may afterwards become due to my Estate and to adjust settle compromise or subject to arbitration any account or accounts which are or shall be <?? ?> between me or my Estate and any person or persons whomsoever and to give or allow such reasonable time or indulgence for the payment of the same debts respectively and in the meantime to accept and take such securities or assurances for the payment thereof as they in their discretion shall think fit and as they shall see . . . . . and that the Trustees and Ex[ecut]ors of this my Will or any more or additional Trustee to be appointed as aforesaid or any or either of them their or any or either of their heirs Executors or Adm[inistrat]ors shall not be charged or chargeable with or accountable for any more of the aforesaid trusts estates monies and premises than they respectively shall actually receive or shall have to their respective hands by virtue if this my Will (notwithstanding their signing or other wise any receipt act or other instrument for the sake of conformity) nor with or for any loss or diminution in value that shall happen of the same or any part thereof either by any deposit made thereof for a sale custody or otherwise so as such loss happen without their wilful neglect or default nor any one or more of them to the others or other or for the acts deeds receipts or disbursements of the others or other of them but each of them for his own acts deeds receipts disbursements and defaults only And also that it shall and may be lawful for them and each and every of them their and each and every of their heirs Ex[ecut]ors and Adm[inistrat]ors in the first place by and out of the aforesaid trust estates monies and premises to deduct retain and reimburse to themselves and each other all such loss costs charges and expenses as they or any or either of them shall be put unto incur or sustain for or by reason of the Executorship or Trusts of this my Will or in relation to the said trust estates monies and premises or the management and execution thereof or any other thing in any wise relating thereto And I nominate and appoint the said David Hermitage Day David John Day Thomas Hermitage Day and David Thomas Alston Executors of this my Will and do revoke and declare void all former Wills and Codicils by me made In Witness whereof I the said William Alston the Testator have to this my last Will and Testament contained in nineteen sheets of paper set my hand & seal that is to say to each of the first eighteen sheets my hand and to this nineteenth and last sheet my hand and Seal the day and year first above written - Wm Alston - Signed Sealed published and declared by the said William Alston the Testator as and for his last Will and Testament in the [presence] of us who in his presence at his request and in the presence of each other have subscribed our names as witnesses thereto the several interlineations obliterations and erasures against which we have put the initial Letters of our names in the margin having been first made and written - D. B. Lewis Sol[icitor] Rochester - James Lewis Rochester - Chas Dorrett Rochester. Proved at London the 25th July 1833 before the [Surrogate] by the Oaths of David Hermitage Day David John Day Thomas Hermitage Day and David Thomas Alston the Son the Executors to whom Admon was granted being first sworn by them duly to Administer. Transcribed by Susan Perrett. Copy on this file. Cresswell notes that this stem was taken from the Rev E Constable Alston's MSS., and is probably conjectural and imperfect. Centre for Kentish Studies Maidstone. L1 - 8 Legal, B1 - 3 Business. Copy of U487/1 catalogue and maps on file & on picture file. Level: Fonds MISCELLANEOUS DEEDS ETC. Scope and Content Demise by letters patent for reversionary term of 22 and a half years at rent of L.10. George III to Thomas Harridge, Thomas Lee, John Durrevel Kemp, Henry Fisher, David Harridge, junior and George King Parcel of ground covered with water being the soil or bed of creek called Leigh Swatch near Leigh, abutting north on Chalkwell Ouze and south on Canvey Spitt and Popling or Popperell Land, extending in length 3 miles from mouth of Swatch at the south-east to the north-west end, and in breadth 154 yards from the low water mark on the north-east side to the low water mark on the south-west side Recites that the premises are parcel of Crown possessions intended for an oyster fishery for the supply of the London markets, and granted by letters patent, 17 June 1762, to Edward Davis, Richard Tidy, John Taylor and Thomas Handley, to hold for 31 years at L.10 per annum Consideration, fine of L.100. Seal of Court of Exchequer Endorsement with exhibition in Chancery, William Alston V. Eastern Counties Railway Company, 1855 and in the matter of the estate of William Alston, 1856. Cheyney Rock Oyster Fishery, Sheerness. The earliest reference to an oyster fishery at Cheyney Rock dates back to 20 November 1657. The reputed largest oyster merchant in the world, a Mr. Alston, once lived & had his main fishery here. Cheyney Rock House was its headquarters. "Messrs. Alston, the spirited owners of Cheyney Rock oyster fisheries, are occupiers under Lady Wenman of the West Grounds and Lapwell. Although in private hands, the number of persons employed is great, and the liberal manner in which the fisheries are carried on adds materially to the prosperity of the town. The oysters sent to London market from these fisheries are not wholly produced here, but are generally bought at other places and deposited in these grounds until they arrive at a proper state of maturity, when they are dredged up and sent to the London market, under the well-known name of "Milton Natives". There is another description of oysters, called common oysters, inferior in flavour and price. The Native Oysters, however, are esteemed the finest and best-flavoured of any in Europe: they are supposed to be the same that Juvenal particularly describes in his 4th satire as being reckoned a delicacy even in his time." "Mr. Alston, who is, without doubt, the largest oyster-fisher in the world, sent up last year between 40,000 and 50,000 bushels from his fishery Cheyney Rock, near Sheerness." "The oyster fisheries of the Cheyney Rock, which stretch along opposite Minster, are very extensive, and of no small celebrity. Their farmer, Mr. Alston, has sent to London in a single season more than 50,000 bushels of "natives" from this single fishery." ". . . . . some large beds belong to private growers— notably to Mr. Alston, who is the very Rothschild of oyster-fishers, and sends to London annually, from his 'farm' at Cheyney Rock, between 45,000 and 50,000 bushels"
"There are several other oyster companies that carry on business in the estuary of the Thames. There is for instance the company of the burghers of Queensborough which is as strictly regulated as that of Whitstable and which produces the fine Milton oysters. We may also mention the Faversham Company which claims to be the most ancient of all the Thames companies it has existed for many centuries. Then there are many gentlemen who own private beds and carry on a large business. Mr Alston a London oyster merchant has always from forty to fifty vessels engaged in the trade. These ships vary from small dredging vessels of eight or ten tons to carrying ships of thirty forty or fifty tons according as they are employed on the home banks or in voyages to Ireland or the Channel Islands." "Milton (pop. 2731), famous for its oysters, which no doubt shared in Koman favour with those "Kutupino edita fundo" (see Ete. 4), or rather, perhaps, ranked themselves as Butupians. The fisheries were granted by King John to the Abbot of Faversham, in whose hands they remained until the Dissolution. They have been dredged from the earliest times by a company of fishermen, ruled like those of Faversham by certain ancient customs and bye-laws. "Milton natives" bear the bell, or more properly are the pearls, among British oysters; and since the discovery of the great sea-beds off Shoreham their value has materially increased, owing to the comparative coarseness and more plentiful supply of the latter. The dredgers work under farmers of the fisheries, the principal of whom until recently was the late Mr. Alston, of Cheyney-rock House, Sheppey, the possessor of very extensive beds between Sheerness and Whitstable, and no doubt the greatest "oyster-farmer" in the world." "The Sheppey oyster fishery is of considerable importance, and its head-quarters are at Cheyney Rock House." "In 1799 William Alston of Rochester 'butcher and cow-keeper' bought, with a John Payne, the Manor of Minster. Eight years later Alston sold the Manor except for the fishery rights of the foreshore between Garrison Point and Scrapsgate and the Cheney Rock oyster beds. The business administered from Cheney Rock House, continued right up to the 1880s. Alston's fleet of dredging smacks was apparently based in the Medway and Swale and their shellfish were carried to the London market by smacks and hoys. The fleet included large craft capable of undertaking the deep-sea dredging in the Channel which included natural beds from Dunkirk and Varne right down to Jersey. Although the heyday of this oyster and scallop free-for-all was over by the 1890s (Olsen's The Fisherman's Nautical Almanac of 1885 lists just one Alston smack at Rochester, the James (RR 258)), a small dwindling Channel scallop fishery persisted up to World War II." A decision to build a pier here must have been due to the excellent tidal access at this point – geographically the best of any point on the island's north shore (and currently the site of a slipway constructed by the IOSSC in the 1960s). The slightly unusual orientation of the pier actually coincides with the prevailing south westerly wind direction (the next most prevalent being north easterly), and was undoubtedly chosen to make it easier to bring vessels alongside 'head to wind'. From the statute (1803), it appears the purpose of the pier was initially for removing gravel, stones, ballast & other materials from the beach. It was probably also used by boats involved with the oyster fishery business, which was also established by the Alston family. The origins of the coal depot are unclear, but it appears to have been setup by either William Alston, or his son David Thomas Alston. The will of D. T. Alston, dated 1 April 1857, held by the National Archives is filed as 'Oyster and Coal Merchant of Cheyney Rock in the Island of Sheppey, Kent'. A law case from 1861 discussing the road from Sheerness to Minster also says "and that carts also came to Cheyney Rock to get coals". The Sheerness Co-operative Coal Depot. 1875: 9th December, at a meeting of the Sheerness Cooperative Society: "directions were unanimously given to enter upon the coal business forthwith. In accordance with this instruction, the vacant yard rear of 43, High Street, Blue Town, was utilised for this purpose, and the first cargo of coals was purchased from the Coal Co-operative Society, London, and quickly sold out; other cargoes followed and a stock maintained. This temporary arrangement was found totally inadequate to meet the increasing demand for coal, and to permanently establish the society as coal merchants of a first rank, attention was directed to the purchase of the well-known Cheyney Rock Coal Depot." 1877, Jul 1: The Sheerness Cooperative Society purchased the the Alston interests in the Cheyney Rock Coal Depot and pier. 1882: William England listed as Manager in Kelly's 1882. 1882, Oct 21: Sheerness newpaper headline: 'Co-op buys a boat "Adolphe & Laura" for coal trade 89ft. long 260 tons'. The "Adolphe and Laura" of Rye was purchased for a total of L650. Alterations were made to render this vessel more suitable for the society's purpose, at a cost of L300 16s 1. The ship was a brigantine (a vessel with two masts, only the forward of which is square rigged). A 1933 plan of the coal yard & jetty. The jetty incorporated a travelling crane ('Trav C'). 1943, May: An American Flying Fortress crash landed into the sea off the coal pier. More info on this website. Ref & Various Images: www.cheyneyrock.co.uk, including an aerial image of Cheyney House 2009 by J. Bell.